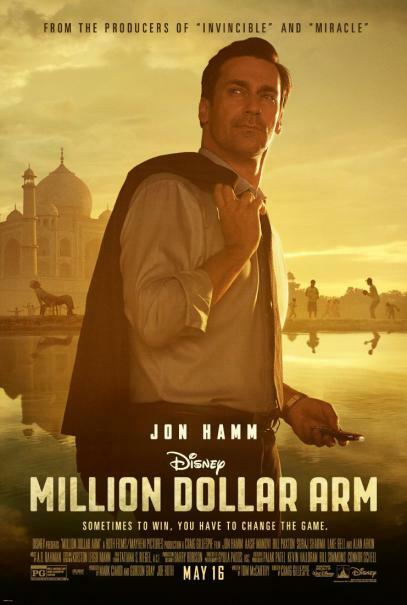 Based on a true story, Disney's "Million Dollar Arm" follows JB Bernstein, a once-successful sports agent who now finds himself edged out by bigger, slicker competitors. He and his partner Aash (Aasif Mandvi) will have to close their business down for good if JB doesn’t come up with something fast. Late one night, while watching cricket being played in India on TV, JB comes up with an idea so radical it just might work. Why not go to there and find the next baseball pitching sensation? Setting off for Mumbai with nothing but a gifted but cantankerous scout (Alan Arkin) in tow, JB stages a televised, nationwide competition called “Million Dollar Arm” where 40,000 hopefuls compete before two 18-year-old finalists, Rinku and Dinesh (Suraj Sharma, Madhur Mittal), emerge as winners. JB brings them back to the United States to train with legendary pitching coach Tom House (Bill Paxton). The goal: get the boys signed to a major league team.